If you anticipate that any of your site collections or business units that use SharePoint Online have a need for external sharing, the first step as a SharePoint Online Administrator is to turn on external sharing. By turning on this feature, users outside of your organization can be invited to SharePoint Online. This one-time action enables the site collection administrators to grant external access to their individual sites without going through the SharePoint Online administrator. Enabling external sharing turns on the feature for all existing and future site collections within your tenancy. This does not, however, mean that all your SharePoint sites are now publicly accessible. 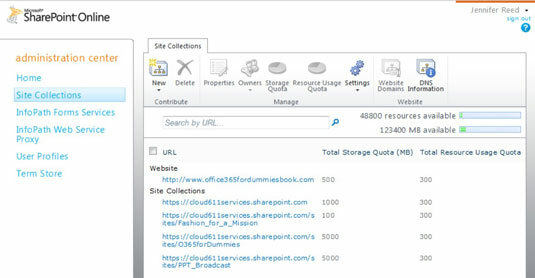 The site collection administrator has to grant someone outside of the company access to a SharePoint site. Click Settings from the action icons on the menu and then click Manage External Users. The External Users window appears. Select the Allow radio button and click Save.